The 1909 Giro d'Italia was the inaugural running of the Giro d'Italia, a cycling race organized and sponsored by the newspaper La Gazzetta dello Sport. The event began in Milan on 13 May with a 397 km (247 mi) first stage to Bologna, finishing back in Milan on 30 May after a final stage of 206 km (128 mi) and a total distance covered of 2,447.9 km (1,521 mi). The race was won by the Italian rider Luigi Ganna of the Atala team, with fellow Italians Carlo Galetti and Giovanni Rossignoli coming in second and third respectively. La Gazzetta dello Sport[la ɡadˈdzetta ˈdello ˈspɔrt]; The Sports Gazette) is an Italian daily newspaper dedicated to coverage of various sports. Founded in 1896, it is the most widely read daily newspaper of any kind in Italy. The Tour de France is an annual men's multiple stage bicycle race primarily held in France, while also occasionally passing through nearby countries. Like the other Grand Tours, it consists of 21 day-long stages over the course of 23 days. The general classification in the Giro d'Italia is the most important classification of the Giro d'Italia, which determines who is the overall winner. It is therefore considered more important than secondary classifications as the points classification or the mountains classification. The points classification in the Giro d'Italia is one of the secondary classifications in the Giro d'Italia. It is determined by points awarded for placings in the daily stages, regardless of time gaps. From 1967 to 1969 the leader wore a red jersey but in 1970 it was changed to mauve, and named the maglia ciclamino, the name of the colour in Italian being derived from the alpine flower the cyclamen. The red jersey was re-introduced in 2010, as the maglia rosso passione. However, in April 2017 RCS Sport, the organisers of the Giro, announced that the maglia ciclamino would be revived for the 2017 Giro d'Italia. The Mountains classification in the Giro d'Italia is a secondary classification that is a part of the Giro d'Italia, one of cycling's Grand Tour races. In this classification, points are awarded to the leading riders over designated climbs. The climbs are put into different classifications based on difficulty and its position on that day's stage. Bonus points are given to mountain top finishes and to the first riders over the Cima Coppi, traditionally adjudged as the highest point of the entire Giro. Luigi Ganna, the winner of the inaugural Giro d'Italia. The Corriere della Sera is an Italian daily newspaper published in Milan with an average daily circulation of 410,242 copies in December 2015. The Giro di Lombardia, officially Il Lombardia, is a cycling race in Lombardy, Italy. It is traditionally the last of the five 'Monuments' of the season, considered to be one of the most prestigious one-day events in cycling, and one of the last events on the UCI World Tour calendar. Nicknamed the Classica delle foglie morte, it is the most important Autumn Classic in cycling. The race's most famous climb is the Madonna del Ghisallo in the race finale. The lira was the currency of Italy between 1861 and 2002 and of the Albanian Kingdom between 1941 and 1943. Between 1999 and 2002, the Italian lira was officially a national subunit of the euro. However, cash payments could be made in lira only, as euro coins or notes were not yet available. The lira was also the currency of the Napoleonic Kingdom of Italy between 1807 and 1814. Luigi Ganna was an Italian professional road racing cyclist. He was the overall winner of the first Giro d'Italia, held in 1909, as well as the first Italian winner of the classic Milan–San Remo earlier that year. Further highlights in his career were his fifth place in the 1908 Tour de France and several podium places in Italian classic races. 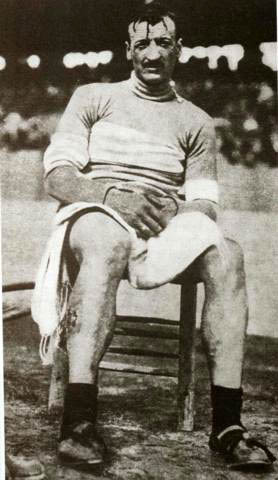 In 1908 he set a new Italian hour record, which he held for six years. Stephen Roche was victorious in 1987, a year in which he also won the Tour and the UCI Road World Championship. American Andrew Hampsten became the first non-European winner the following year,  and Laurent Fignon was victorious in 1989. Spaniard Miguel Indurain, winner of five Tours, won successive Giros in 1991 and 1992. Three time winner of the Vuelta a España, Tony Rominger was victorious in 1995, defeating the previous winner Evgeni Berzin. Marco Pantani was the winner in 1998, a year in which he completed the Tour and Giro double, Ivan Gotti won the previous Giro in 1997 and the subsequent one in 1999. In the 2011 Giro d'Italia, Wouter Weylandt suffered a fatal crash on the 3rd stage. Ryder Hesjedal became the first Canadian to win the Giro in 2012, beating Joaquim Rodríguez by 16 seconds. After gaining the lead after the eighth stage, Vincenzo Nibali won two more stages to help consolidate his lead and win the 2013 edition. In 2014, Nairo Quintana became the first South American rider to win the race overall, Contador and Nibali won their second title each in 2015 and 2016. In 2017, Tom Dumoulin won the overall race by 31 seconds over Quintana, becoming the first Dutchman to win the Giro and the first to win a Grand Tour since 1980. A year later, Chris Froome won the 2018 edition and became the first British rider to win the race, turning over a nearly 5-minute deficit in the final week with an 80-kilometer solo breakaway on stage 19. Froome won by 46 seconds over Dumoulin. 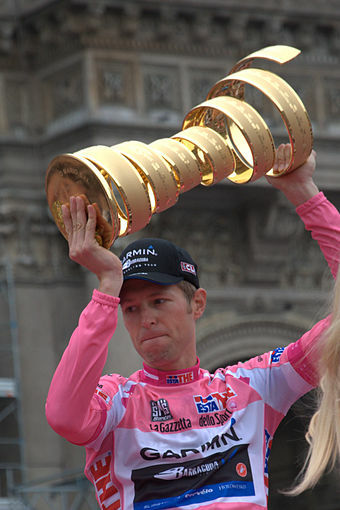 Ryder Hesjedal, the winner of the 2012 Giro d'Italia, wearing the maglia rosa and holding the winner's trophy in Milan. The most sought after classification in the Giro d'Italia is the general classification. All of the stages are timed to the finish, after finishing the riders' times are compounded with their previous stage times; so the rider with the lowest aggregate time is the leader of the race. The leader is determined after each stage's conclusion. The leader of the race also has the privilege to wear the race leader's pink jersey. The jersey is presented to the leader rider on a podium in the stage's finishing town. If a rider is leading more than one classification that awards a jersey, he will wear the maglia rosa since the general classification is the most important one in the race. The lead can change after each stage. Flat finish 10" 6" 4"
Intermediate Sprint 3" 2" 1"
Stefano Garzelli wearing the then green leader's jersey for the mountains classification in 2009. The classification awarded no jersey to the leader until the 1974 Giro d'Italia, when the organizers decided to award a green jersey to the leader. The green jersey was used until 2012, when the classification's sponsor, Banca Mediolanum, renewed its sponsorship for another four years and desired the jersey to be blue rather than green. Chris Froome won the mountains classification at the 2018 Giro d'Italia. Michele Scarponi wearing the red jersey during the 2011 Giro d'Italia. The points classification is the third oldest of the four jersey current awarding classifications in the Giro d'Italia. It was introduced in the 1966 Giro d'Italia and was first won by Gianni Motta. Points are given to the rider who is first to reach the end of, or determined places during, any stage of the Giro. The red jersey is worn by the rider who at the start of each stage, has the largest amount of points. The rider who, at the end of the Giro, holds the most points, wins the points competition. Each stage win, regardless of the stage's categorization, awards 25 points, second place is worth 20 points, third 16, fourth 14, fifth 12, sixth 10, and one point less per place down the line, to a single point for fifteenth. This means that a true sprinter might not always win the points classification. The classification was added to draw the participation of the sprinters. The classification has been won four times by two riders: Francesco Moser and Giuseppe Saronni. The 2018 winner of the classification was Elia Viviani. The Young rider classification is restricted to the riders that are under the age of 25. The leader of the classification is determined the same way as the general classification, with the riders' times being added up after each stage and the eligible rider with lowest aggregate time is dubbed the leader. This classification was added to the Giro d'Italia in the 1976 edition, with Alfio Vandi being the first to win the classification after placing seventh overall. The classification was not contested between the years of 1995 and 2006. The classification was reintroduced in the 2007, and has been in each Giro since. The Giro d'Italia awards a white jersey to the leader of the classification. Evgeni Berzin is the only rider in the history of the Giro d'Italia to win the young rider classification and the general classification in the same year; Berzin won both classifications in 1994. Two riders have won the young rider classification twice in their respective careers: Vladimir Poulnikov and Pavel Tonkov. In 2018 it was won by Miguel Ángel López. There are two team classifications that are contested at the Giro d'Italia: the Trofeo Fast Team and the Trofeo Super Team. The Trofeo Fast Team is the older of the two as it was introduced in the first Giro d'Italia. It was first won by Atala. The Trofeo Fast Team is calculate by adding the times of the best three cyclists per team on each stage were added; the leading team was the team with the lowest total time. The classification just called the team classification in each edition until the organizers changed it to the Trofeo Fast Team for the 1994 Giro d'Italia. Team Sky won the Trofeo Fast Team classification in 2018. The Trofeo Super Team was introduced at the 1993 Giro d'Italia as the team points classification. The name Trofeo Super Team was adopted for the 1994 edition of the Giro and been used ever since. The classification was first won by Ariostea in 1993. The classification is a team points classification, with the top 20 placed riders on each stage earning points (20 for first place, 19 for second place and so on, down to a single point for 20th) for their team. The Trofeo Super Team classification was discontinued in 2017, which was won by Quick-Step Floors. Other less well-known classifications, whose leaders did not receive a special jersey, are awarded during the Giro. These awards were based on points earned throughout the three weeks of the tour. Each mass-start stage had one intermediate sprint, the Traguardo Volante, or T.V. The T.V. gave bonus seconds towards the general classification, points towards the regular points classification, and also points towards the T.V. classification. This award was known by various names in previous years, and was previously time-based. In 2013 this classification was renamed to the sprints classification and was won by Rafael Andriato. Other awards include the Combativity classification, which was a compilation of points gained for position on crossing intermediate sprints, mountain passes and stage finishes. It was won by Mark Cavendish in 2013. The Azzurri d'Italia classification is based on finishing order; however, points were awarded only to the top three finishers in each stage. It was also most recently won by Mark Cavendish. Additionally, the Trofeo Fuga Pinarello rewarded riders who took part in a breakaway at the head of the field, each rider in an escape of ten or fewer riders getting one point for each kilometre that the group stayed clear. Vini Fantini–Selle Italia's Rafael Andriato was first in this competition in 2013. Teams were given penalty points for minor technical infringements. Several teams tied for the Fair Play classification in 2018, not receiving any points. In 1946 the maglia nera (black jersey) was introduced and awarded the cyclist who was last in the general classification. Riders sometimes deliberately wasted time in order to become last overall and so wear the black jersey. The classification was short lived, as it was last contested in the 1951 Giro d'Italia. The classification was won twice by Luigi Malabrocca, who won the classification in 1946 and 1947. The last winner of the maglia nera was Giovanni Pinarello. There was also a combination classification that was introduced in the 1985 Giro d'Italia and was first won by Urs Freuler. The classification was discontinued after the 1988 Giro d'Italia. For the 1988 edition of the Giro, the classification awarded a blue jersey. 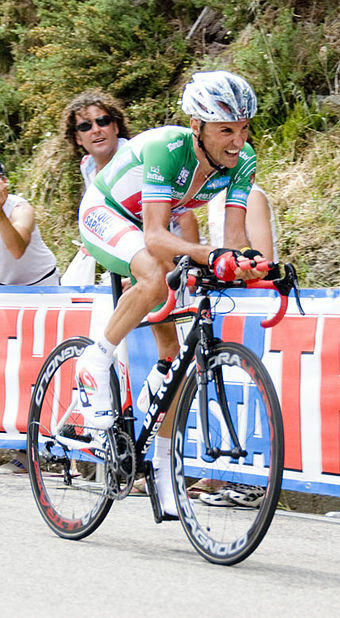 However, the classification was reintroduced for the 2006 Giro d'Italia and was won by Paolo Savoldelli. The classification was not brought back in the 2007 Giro d'Italia. The peloton in stage 7 of the 2012 Giro d'Italia. Most of the stages in the race are usually mass-start stages, with the whole peloton starting together. Mass-start stages begin in different towns with a send off to gain publicity, the riders ride without racing. The riders then ride a few kilometers around the stage's start town before reaching kilometer zero, where the race director then waves a flag to start the stage's racing. Once the flag is waved there are usually attacks by the riders to form a breakaway. Riders are permitted to touch, but not push or nudge, each other. The first to cross the line wins. On flat stages or stages with low hills, which generally predominate in the first week, this leads to spectacular mass sprints. Time bonuses were awarded in the Giro for finishing high in the stages, in the first three positions. The stage's first placed rider receives ten seconds, second placed six seconds, and the third placed rider receives four seconds. Alberto Contador riding a time trial during the 2008 Giro d'Italia. There are usually two or three time trials, with team time trials being included in the tally, in each modern edition of the Giro d'Italia. The final time trial has sometimes been the final stage, more recently often the penultimate stage. The Garmin–Barracuda team during the stage 4 in the 2012 Giro d'Italia. Gilberto Simoni in 2010 riding the stage 1 time trial that navigated through Amsterdam. The Giro takes place mainly in Italy, but some stages have departure or conclusion locations in other countries, especially in neighboring countries such as San Marino, France, Monaco, Switzerland, Austria, Croatia and Slovenia. 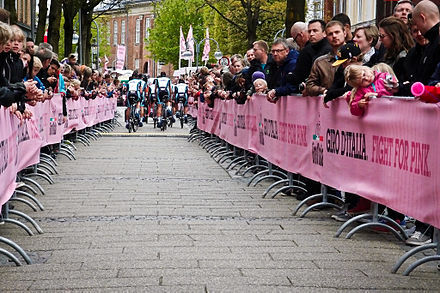 Some stages have been held in the Netherlands, Belgium, Germany (2002 and 2006), Greece (1996)  and Denmark (2012)   The 2014 edition of the Giro started in Belfast. The Omega Pharma–Quick-Step team at the team presentation for the 2012 Giro d'Italia in Herning, Denmark. 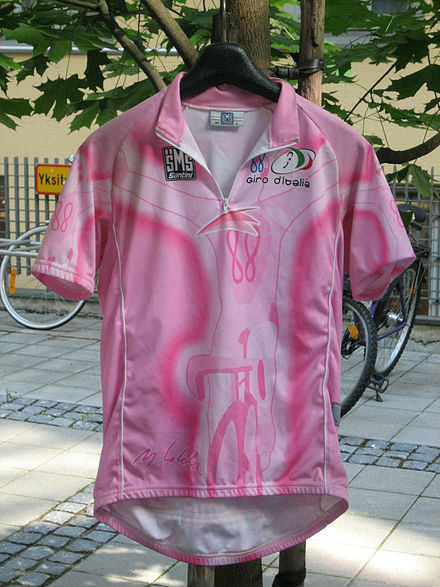 The 2004 Giro d'Italia was the 87th edition of the Giro d'Italia, one of cycling's Grand Tours. The Giro began in Genoa with a 6.9 km (4.3 mi) prologue. The race came to a close with a 133 km (82.6 mi) mass-start road stage that stretched from Clusone to Milan. Nineteen teams entered the race that was won by the Italian Damiano Cunego of the Saeco Macchine per Caffè team. Second and third were the Ukrainian Serhiy Honchar and Italian Gilberto Simoni. The 2003 Giro d'Italia was the 86th edition of the Giro d'Italia, one of cycling's Grand Tours. The Giro began in Lecce with a 201 km (125 mi) mass-start stage. The race came to a close with a 33 km (21 mi) individual time trial that began and ended in the Italian city of Milan. Nineteen teams entered the race that was won by the Italian Gilberto Simoni of the Saeco Macchine per Caffè team. Second and third were the Italian Stefano Garzelli and Ukrainian Yaroslav Popovych. The 2006 Giro d'Italia was the 89th edition of the Giro d'Italia, one of cycling's Grand Tours. The Giro began in the Belgian city of Seraing with a 6.2 km (3.9 mi) individual time trial. The race came to a close with a 140 km (87.0 mi) mass-start road stage that stretched from Museo del Ghisallo to Milan. Twenty two teams entered the race that was won by the Italian Ivan Basso of the Team CSC team. Second and third were the Spain José Enrique Gutiérrez and Italian Gilberto Simoni. The 2000 Giro d'Italia was the 83rd edition of the Giro d'Italia, one of cycling's Grand Tours. The Giro began with a 4.6 km (3 mi) prologue that navigated through the Italian capital Rome. The race came to a close on June 4 with a mass-start stage that ended in the Italian city of Milan. Twenty teams entered the race that was won by the Italian Stefano Garzelli of the Mercatone Uno–Albacom team. Second and third were the Italian riders Francesco Casagrande and Gilberto Simoni. The 1977 Giro d'Italia was the 60th running of the Giro d'Italia, one of cycling's Grand Tours races. The Giro started in Bacoli, on 20 May, with a 7 km (4.3 mi) prologue and concluded in Milan, on 13 June, with a 122 km (75.8 mi) mass-start stage. A total of 130 riders from thirteen teams entered the 22-stage race, that was won by Belgian Michel Pollentier of the Flandria team. The second and third places were taken by Italians Francesco Moser and Gianbattista Baronchelli, respectively. The 1979 Giro d'Italia was the 62nd running of the Giro d'Italia, one of cycling's Grand Tours races. The Giro started in Genoa, on 17 May, with a 8 km (5.0 mi) prologue and concluded in Milan, on 6 June, with a 44 km (27.3 mi) individual time trial. A total of 130 riders from thirteen teams entered the 19-stage race, that was won by Italian Giuseppe Saronni of the Scic-Bottecchia team. The second and third places were taken by Italian Francesco Moser and Swede Bernt Johansson, respectively. The 1975 Giro d'Italia was the 58th running of the Giro d'Italia, one of cycling's Grand Tours races. The Giro started in Milan, on 17 May, with a set of split stages and concluded with a summit finish to the Passo dello Stelvio, on 7 June, with another split stage, consisting of an individual time trial and a mass-start stage. A total of 90 riders from nine teams entered the 22-stage race, that was won by Italian Fausto Bertoglio of the Jolly Ceramica team. The second and third places were taken by Spaniard Francisco Galdós and Italian Felice Gimondi, respectively. The 1973 Giro d'Italia was the 56th running of the Giro d'Italia, one of cycling's Grand Tours races. The Giro started in Verviers, Belgium, on 18 May, with a 5.2 km (3.2 mi) prologue and concluded with a 197 km (122 mi) mass-start stage, on 9 June. A total of 140 riders from fourteen teams entered the 20-stage race, that was won by Belgian Eddy Merckx of the Molteni team. The second and third places were taken by Italians Felice Gimondi and Giovanni Battaglin, respectively. The 1998 Giro d'Italia was the 81st edition of the Giro d'Italia, one of cycling's Grand Tours. The Giro began on May 16 with a brief 8 km (5 mi) prologue that navigated through the streets of the French city Nice. The race came to a close on June 7 with a mass-start stage that ended in the Italian city of Milan. Eighteen teams entered the race that was won by the Italian Marco Pantani of the Mercatone Uno–Bianchi team. Second and third were the Russian rider Pavel Tonkov and Italian Giuseppe Guerini. The 1976 Giro d'Italia was the 59th running of the Giro d'Italia, one of cycling's Grand Tours races. The Giro started in Catania, on 21 May, with a set of split stages and concluded in Milan, on 12 June, with another split stage, consisting of an individual time trial and a mass-start stage. A total of 120 riders from twelve teams entered the 22-stage race, that was won by Italian Felice Gimondi of the Bianchi-Campagnolo team. The second and third places were taken by Belgian Johan De Muynck and Italian Fausto Bertoglio, respectively. The 1978 Giro d'Italia was the 61st running of the Giro d'Italia, one of cycling's Grand Tours races. The Giro started in Saint-Vincent, on 7 May, with a 2 km (1.2 mi) prologue and concluded in Milan, on 28 May, with a 220 km (136.7 mi) mass-start stage. A total of 130 riders from thirteen teams entered the 20-stage race, that was won by Belgian Johan de Muynck of the Bianchi team. The second and third places were taken by Italians Gianbattista Baronchelli and Francesco Moser, respectively. The 1947 Giro d'Italia was the 30th edition of the Giro d'Italia, a cycling race organized and sponsored by the newspaper La Gazzetta dello Sport. The race began on 24 May in Milan with a stage that stretched 190 km (118 mi) to Turin, finishing back in Milan on 15 June after a 278 km (173 mi) stage and a total distance covered of 3,843 km (2,388 mi). The race was won by the Italian rider Fausto Coppi of the Bianchi team, with fellow Italians Gino Bartali and Giulio Bresci coming in second and third respectively. The 1950 Giro d'Italia was the 33rd edition of the Giro d'Italia, one of cycling's Grand Tours. The Giro started off in Milan on 24 May with a 225 km (139.8 mi) individual time trial and concluded in Salsomaggiore Terme with a 230 km (142.9 mi) relatively flat mass-start stage on 13 June. Fifteen teams entered the race, which was won by Swiss Hugo Koblet of the Guerra team. Second and third respectively were Italians Gino Bartali and Alfredo Martini. The 1946 Giro d'Italia was the 29th edition of the Giro d'Italia, a cycling race organized and sponsored by the newspaper La Gazzetta dello Sport. The race began on 15 June in Milan with a stage that stretched 185 km (115 mi) to Turin, finishing back in Milan on 7 July after a 176 km (109 mi) stage and a total distance covered of 3,039.5 km (1,889 mi). The race was won by the Italian rider Gino Bartali of the Legnano team, with fellow Italians Fausto Coppi and Vito Ortelli coming in second and third respectively. The 1939 Giro d'Italia was the 27th edition of the Giro d'Italia, a cycling race organized and sponsored by the newspaper La Gazzetta dello Sport. The race began on 28 April in Milan with a stage that stretched 182 km (113 mi) to Turin, finishing back in Milan on 18 May after a split stage and a total distance covered of 3,011.4 km (1,871 mi). The race was won by the Italian rider Giovanni Valetti of the Fréjus team, with fellow Italians Gino Bartali and Mario Vicini coming in second and third respectively. The 1938 Giro d'Italia was the 26th edition of the Giro d'Italia, a cycling race organized and sponsored by the newspaper La Gazzetta dello Sport. The race began on 7 May in Milan with a stage that stretched 182 km (113 mi) to Turin, finishing back in Milan on 29 May after a split stage and a total distance covered of 3,645.8 km (2,265 mi). The race was won by the Italian rider Giovanni Valetti of the Fréjus team, with fellow Italians Ezio Cecchi and Severino Canavesi coming in second and third respectively. The 1937 Giro d'Italia was the 25th edition of the Giro d'Italia, a cycling race organized and sponsored by the newspaper La Gazzetta dello Sport. The race began on 8 May in Milan with a stage that stretched 165 km (103 mi) to Turin, finishing back in Milan on 30 May after a split stage and a total distance covered of 3,840 km (2,386 mi). The race was won by the Italian rider Gino Bartali of the Legnano team, with fellow Italians Giovanni Valetti and Enrico Mollo coming in second and third respectively. The 2010 Giro d'Italia was the 93rd edition of the Giro d'Italia, one of cycling's Grand Tours. The Giro started off in Amsterdam on 8 May and stayed in the Netherlands for three stages, before leaving the country. The route included climbs such as Monte Zoncolan, Plan de Corones, the Passo del Mortirolo and the Passo di Gavia before ending in Verona with an individual time trial. The 1919 Giro d'Italia was the 7th edition of the Giro d'Italia, a cycling race organized and sponsored by the newspaper La Gazzetta dello Sport. The race began on 21 May in Milan with a stage that stretched 302.8 km (188 mi) to Trento, finishing back in Milan on 8 June after a 277 km (172 mi) stage and a total distance covered of 2,984 km (1,854 mi). The race was won by the Italian rider Costante Girardengo of the Stucchi team. Second and third respectively were Italian Gaetano Belloni and Belgian Marcel Buysse. ↑ Juliet Macur (29 May 2015). "'Gironimo!' and 'Lanterne Rouge'". New York Times. ↑ Stephen Farrand (13 March 2016). "Nibali could skip Giro d'Italia due to risk of mountain stage cancellations". Cycling News. 1 2 3 4 5 6 7 8 9 10 11 12 13 Gregg Seltzer (26 May 2011). "The History of the Giro d'Italia". Livestrong. Retrieved 30 July 2012. 1 2 3 "Tour d'Italie ou Giro d'Italia" [Tour of Italy or Giro d'Italia] (in French). Larousse.fr. 30 March 2012. Retrieved 10 August 2012. ↑ McGann, Bill; McGann, Carol. "1909 Giro d'Italia". Bike Race Info. Dog Ear Publishing. Retrieved 30 July 2012. ↑ "RCS Sport". RCSMediaGroup. RCS MediaGroup S.p.A. 24 January 2013. Retrieved 20 June 2013. ↑ "2012 - 2013 UCI Road Calendar". Union Cycliste Internationale. Union Cycliste Internationale. Archived from the original on 17 February 2009. Retrieved 6 June 2013. ↑ Nigel Wynn (2 November 2011). "UCI WorldTour calendar 2012". Cycling Weekly. IPC Media Limited. Retrieved 6 August 2012. ↑ "Million dollar, baby!". Cycling News. Future Publishing Limited. 12 January 2007. Retrieved 21 May 2011. ↑ "Ryder Hesjedal in pink as Giro d'Italia hits the Alps". Perth Now. News Ltd. 20 May 2012. Retrieved 30 July 2012. 1 2 3 4 5 6 7 8 9 10 11 12 13 14 15 16 17 18 19 20 21 22 23 24 25 26 27 28 29 30 31 Laura Weislo (13 May 2008). "Giro d'Italia classifications demystified". Cycling News. Future Publishing Limited. Retrieved 27 August 2009. 1 2 3 4 5 Fotheringham, William (30 June 2003). "The Heroic Age". Century of Cycling: The Classic Races and Legendary Champions. London, England, United Kingdom: MBI Publishing Company. pp. 103–104. ISBN 978-0-7603-1553-8 . Retrieved 17 July 2012. 1 2 3 4 5 6 7 8 9 Bill and Carol McGann. "1909 Giro d'Italia". Bike Race Info. Dog Ear Publishing. Retrieved 10 July 2012. 1 2 3 4 5 6 7 8 9 10 11 12 13 14 15 16 17 18 19 20 21 22 23 "History". La Gazzetta dello Sport. RCS MediaGroup. Retrieved 15 September 2010. 1 2 Leslie Reissner (23 June 2011). "The Giro d'Italia: Don't Go Home Yet!". PezCycling News. Retrieved 27 May 2012. 1 2 "La Vuelta De Italia" [The Giro d'Italia](PDF). El Mundo Deportivo (in Spanish). 10 June 1909. p. 3. Retrieved 27 May 2012. ↑ Castelnovi, Giuseppe (9 June 2001). "qual e' stato il giro d' italia piu' lungo, e quale il piu' breve ?". La Gazzetta dello Sport (in Italian). Retrieved 6 September 2010. ↑ "Giro d'Italia: In numbers". Eurosport. 6 May 2011. Retrieved 17 July 2011. ↑ Gallagher, Brendan (7 May 2009). "Giro d'Italia celebrates centenary year". The Daily Telegraph. London. Retrieved 4 September 2010. ↑ Stanley, Alessandra (6 May 2000). "Gino Bartali, 85, a Hero in Italy For His Cycling Championships". The New York Times. New York City. Retrieved 5 September 2010. 1 2 Henderson, Greg (15 May 2009). "50 Giro facts you need to know". Cycling News. Future Publishing Limited. Retrieved 5 September 2010. ↑ "Jacques Anquetil". The Daily Telegraph. London. 12 May 2010. Retrieved 17 July 2011. ↑ "Grand Tour Doubles – Bernard Hinault". Cycle Sport. IPC Media. Retrieved 17 July 2011. ↑ Doyle, Paul (5 July 2007). "Roche remembers his annus mirabilis". The Guardian. London. Retrieved 5 September 2010. ↑ Benson, Andrew (19 March 2004). "End of a troubled ride". BBC Sport. Retrieved 5 September 2010. ↑ Ekström, Gabriella (3 June 2000). "Stage 20 – June 3: Briancon to Sestrieres, (ITT) 34 km". Cycling News. Future Publishing Limited. Retrieved 5 September 2010. ↑ "Italian Di Luca fails doping test". BBC Sport. 22 July 2009. Retrieved 6 September 2010. ↑ "Menchov wins Giro despite crash". BBC Sport. 31 May 2009. Retrieved 6 September 2010. ↑ "Italy's Ivan Basso wins second Giro d'Italia title". BBC Sport. 30 May 2010. Retrieved 4 September 2010. ↑ "Alberto Contador wins 2011 Giro d'Italia". BBC Sport. 29 May 2011. Retrieved 29 May 2011. ↑ Fotheringham, William (6 February 2012). "Alberto Contsdor gets two-year ban and stripped of 2010 Tour de France". The Guardian. Retrieved 6 February 2012. ↑ "Giro d'Italia 2012: Ryder Hesjadel is first Canadian to win the race". BBC Sport. 27 May 2012. Retrieved 27 May 2012. ↑ Benson, Daniel (26 May 2013). "Giro d'Italia: Nairo Quintana seals overall victory in Trieste". Cycling News. Future Publishing Limited. Archived from the original on 13 March 2015. Retrieved 5 September 2010. ↑ VeloNews.com (17 June 2005). "Happy Birthday, Eddy!". VeloNews. Competitor Group, Inc. Retrieved 23 June 2012. ↑ VeloNews.com (15 March 2012). "Giro d'Italia Hall of Fame inducts Eddy Merckx as its first member". VeloNews. Competitor Group, Inc. Retrieved 23 June 2012. ↑ "The Belgian Italians couldn't resist - Eddy Merckx". Cycling News. Future Publishing Limited. 28 May 2011. Retrieved 1 October 2012. 1 2 3 4 "Giro d'Italia 2009" (PDF). Infostrada sports. 2009. p. 187. Retrieved 29 June 2011. ↑ McGann, Bill; McGann, Carol. "1910 Giro d'Italia". Bike Race Info. Dog Ear Publishing. Retrieved 6 August 2012. 1 2 McGann, Bill; McGann, Carol. "1913 Giro d'Italia". Bike Race Info. Dog Ear Publishing. Retrieved 6 August 2012. ↑ McGann, Bill; McGann, Carol. "1914 Giro d'Italia". Bike Race Info. Dog Ear Publishing. Retrieved 6 August 2012. 1 2 3 4 5 6 7 8 9 10 11 12 13 14 15 16 17 18 19 20 21 22 23 24 25 "Formula and Itinerary" (PDF). Gazzetta della Sport. 2012. pp. 6–7. Retrieved 29 June 2012. 1 2 3 McGann, Bill; McGann, Carol. "1933 Giro d'Italia". Bike Race Info. Dog Ear Publishing. Retrieved 6 August 2012. ↑ Cycling News (17 December 2011). "Blue Mountains Jersey For 2012 Giro D'Italia". Cycling News. Future Publishing Limited. Retrieved 20 June 2013. ↑ "Giro dItalia 2015 Preview: The Mountain Classification". Cycling updates. 5 May 2015. Archived from the original on 12 May 2015. ↑ McGann, Bill; McGann, Carol. "1966 Giro d'Italia". Bike Race Info. Dog Ear Publishing. Retrieved 6 August 2012. ↑ Cycling News (15 January 2010). "2010 Giro jersey presented in Florence". Cycling News. Future Publishing Limited. Archived from the original on 18 January 2010. Retrieved 20 June 2013. 1 2 3 4 5 6 Gregor Brown (4 December 2006). "First Edition Cycling News for December 4, 2006". Cycling News. Future Publishing Limited. Retrieved 30 July 2012. 1 2 3 "Giro, la Maglia nera diventa Numero nero" [The Giro, the black jersey becomes the black number]. La Gazzetta dello Sport (in Italian). Milan, Italy: RCS MediaGroup. 11 January 2008. Retrieved 4 August 2012. 1 2 3 "91st Giro d'Italia – GT". Cycling News. Future Publishing Limited. 1 June 2008. Retrieved 20 June 2013. ↑ "Giro d'Italia, Intergiro-Wertung". Radsport-seite.de. Retrieved 4 August 2012. ↑ "Hinault: Tres Vidas En Rosa" [Hinault: Three Lives In Pink](PDF). El Mundo Deportivo (in Spanish). 10 June 1985. p. 34. Retrieved 27 May 2012. ↑ Richard Pestes (1 December 2007). "Giro 1988: Andy's Epic Day". PezCycling News. Retrieved 27 May 2012. ↑ Anthony Tan (28 May 2006). ""Seven key moments"; Mission 1 of 2 complete". Cycling News. Future Publishing Limited. Retrieved 20 June 2013. 1 2 3 4 5 6 7 8 9 "Tour de France: Time Trials, Mountains Stages, Prologues, and More – For Dummies". Dummies.com. 2008-11-07. Retrieved 6 August 2012. 1 2 "Giro d'Italia – Giro d'Italia: In numbers". Eurosport. Yahoo! and Eurosport. 6 May 2011. Retrieved 13 August 2011. ↑ Fabio (9 November 2003). "87th Giro d'Italia: a bit of History". dailypeloton.com. Retrieved 29 October 2007. 1 2 3 McGann, Bill; McGann, Carol. "1911 Giro d'Italia". Bike Race Info. Dog Ear Publishing. Retrieved 6 August 2012. ↑ "Le Giro a 100 ans" [The Giro d'Italia is 100 Years Old]. larousse.fr (in French). Archived from the original on 13 February 2013. Retrieved 16 September 2010. 1 2 3 4 McGann, Bill; McGann, Carol. "1937 Giro d'Italia". Bike Race Info. Dog Ear Publishing. Retrieved 6 August 2012. ↑ Daniel Friebe (25 May 2012). "The Stelvio: The sacred mountain of the Giro d'Italia". Cycling News. Future Publishing Limited. Retrieved 30 July 2012. ↑ McGann, Bill; McGann, Carol. "1965 Giro d'Italia". Bike Race Info. Dog Ear Publishing. Retrieved 6 August 2012. 1 2 3 McGann, Bill; McGann, Carol. "1968 Giro d'Italia". Bike Race Info. Dog Ear Publishing. Retrieved 6 August 2012. ↑ Ian Chadband (5 May 2013). "Giro d'Italia 2013, stage two: Team Sky storm to victory in team time-trial as Salvatore Puccio takes maglia rosa". The Daily Telegraph. London: Telegraph Media Group Limited. Retrieved 4 August 2012. ↑ "Giro d'Italia 2010 – 4th stage – Liquigas-Doimo wins the team time trial, Vincenzo Nibali takes the maglia rosa". velowire.com. 12 May 2012. Retrieved 6 August 2012. 1 2 Gregor Brown (9 May 2012). "Teams are ready for Giro's team time trial". Cycling Weekly. IPC Media Limited. Retrieved 6 August 2012. 1 2 Jean-François Quénet (9 May 2012). "Farrar Only 10 Seconds Away From The Giro's Pink Jersey". Cycling News. Future Publishing Limited. Retrieved 6 August 2012. 1 2 3 4 5 6 Gregor Brown (15 December 2012). "Foreign grand tour starts are big business". VeloNews. Competitor Group, Inc. Retrieved 23 June 2012. ↑ "Giro d'Italia". Milan Tourism. Milano City. 5 May 2012. Retrieved 10 August 2012. ↑ "May 27, Stage 21: Milan (ITT) 31.5km". Cycling News. Future Publishing Limited. Retrieved 19 July 2012. ↑ Sheree (12 May 2012). "Friday Feature: Giro d'Italia starts on foreign soil". Velo Voices. Retrieved 6 August 2012. ↑ "Stages". La Gazzetta dello Sport (in Italian). RCS MediaGroup. Archived from the original on 18 February 2009. Retrieved 20 June 2013. ↑ "Stage 21 – Sunday, May 31: Roma (ITT), 14.4km". Cycling News. Future Publishing Limited. 9 May 2009. Retrieved 9 May 2009. ↑ McGann, Bill; McGann, Carol. "1951 Giro d'Italia". Bike Race Info. Dog Ear Publishing. Retrieved 6 August 2012. ↑ Gregor Brown (24 October 2009). "Zomegnan Presents An All-inclusive 2010 Giro D'Italia". Cycling News. Future Publishing Limited. Retrieved 19 August 2012. ↑ Stephen Farrand (13 September 2013). "2014 Giro d'Italia to end in Trieste". Cycling News. Future Publishing Limited. Retrieved 4 December 2017. 1 2 3 "2012 Giro d'Italia Start: to Denmark!". Bianchi USA. 1 April 2011. Retrieved 6 August 2012. 1 2 3 4 5 6 7 Fabio. "Giro d'Italia Stage Detail". Daily Peloton. Retrieved 6 August 2012. ↑ VeloNews.com (24 May 2010). "2012 Giro d'Italia to start in Denmark, not Washington, D.C." VeloNews. Competitor Group, Inc. Retrieved 1 April 2011. ↑ Alasdair Fotheringham (5 May 2012). "The Most International Giro D'Italia Ever?". Cycling News. Future Publishing Limited. Retrieved 20 August 2012. 1 2 Stokes, Shane (23 November 2017). "Human rights groups and others call on Giro d'Italia to abandon Israel start". Cyclingtips.com. ↑ "Anti-Israel protesters try to disrupt Giro d'Italia cycling race in Sicily". Times of Israel. 8 May 2018. ↑ "Comment: Why I will be boycotting the Giro's 2018 start in Jerusalem". 10 October 2017. ↑ Lungen, Paul; Reporter, Staff (1 May 2018). "Q&A with Sylvan Adams: the man who brought the Giro d'Italia to Israel". ↑ Luca Gialanella (11 April 2011). "Il Giro è sempre più globale Nel 2012 il via dalla Danimarca" [The Giro is increasingly global in 2012 by Denmark]. La Gazzetta dello Sport (in Italian). RCS MediaGroup. Retrieved 10 July 2012. 1 2 3 4 5 6 7 8 9 10 11 Cycling News (21 February 2013). "Giro d'Italia confirmed start in Ireland for 2014". Cycling News. Future Publishing Limited. Retrieved 21 February 2013. ↑ "Giro to start in Ireland in 2014". ESPN. Associated Press. 21 February 2013. Retrieved 21 February 2013. ↑ "Giro 2016 start in Nederland". NOS. NOS. 26 May 2014. Retrieved 26 May 2014. ↑ "Giro d'Italia 2016". La Gazetta. 26 June 2015. Retrieved 28 June 2015. ↑ "Giro d'Italia, oggi il via a Gerusalemme: crono a pochi metri dal Santo Sepolcro". Il Messaggero. May 3, 2018. Retrieved April 11, 2019. ↑ "Giro d'Italia to start in Budapest in 2020". 2WheelsToday. Retrieved April 15, 2019. Wikimedia Commons has media related to Giro d'Italia .